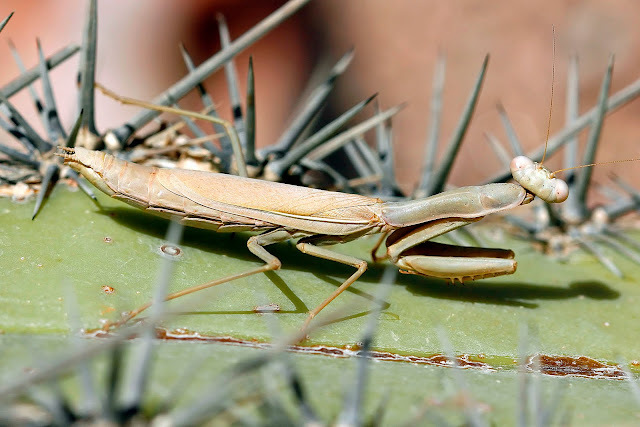 OK, I know it has only been a little over a month since my last Mantis post, but I thought that this Mediterranean Mantis (Iris oratoria) posed in my front yard so nicely for me that I should return the favor and post it on the web. What is unique about this mantis is how brown it is. Most of the other Mediterranean's I've seen are various shades of green. The kind folks at Bugguide.net identified this as a female. While this photo is not as captivating as some of those from my previous Mantis post, it is a nice view of the full body all generally in focus. Additionally, you can see that it is a 'back of the head' shot. Those famous compound eyes give an impression of pupils (called pseudopupils) looking back at me. Be sure to click the photo for the full-sized image. Great macro photo with perfect focusing!!! Fabulous details and light in this macro image!